After the success of the pumpkin pie pancakes that I made a while ago I was thinking that sweet potato pie pancakes would also be good. The basic idea was a pancake with all of the flavours of a sweet potato pie or a sweet potato casserole . I pretty much just took my basic pancake recipe with some of the flour replaced with whole wheat flour and added some pureed sweet potato long with some spices like cinnamon and nutmeg. For the sweet potato puree, you just need to cook a sweet potato until it is nice and soft and mash it up. I like to slow roast sweet potatoes as they caramelize and that adds a ton of flavour. The Sweet potato pie pancakes turned out great! They were nice and light and fluffy and moist and good. I really enjoyed the sweet potato flavour in the pancakes. I served the sweet potato pancakes with maple syrup, toasted pecans and topped them off with a slice of melting butter. It is always fun transforming your favorite deserts into breakfasts! Mix the flour, baking powder, sugar, cinnamon and nutmeg in a large bowl. Mix the buttermilk, egg, butter and mashed sweet potato in another bowl. I’m a big fan of both sweet potato pie and pancakes so I can’t wait to try these! I love sweet potatoes. The pie looks droolworthy! We are breakfast fiends and those are on my radar, they look amazing! These look delicious! Pancakes are one of my top five favorite foods, so these are right up my alley. Oh wow, what an awesome pancake idea! yum! there is no way these would have lasted long enough to photograph in my house!! Wow, after dinner is not a good time to be craving for these…looks delicious! I’ll bet these are really moist too. Nice idea. What an ingenious idea! They look delish. Yikes. That looks WONDERFUL, and I am decidedly not a pancake person. There is a great diner in Lafayette, Louisiana named Dwyer’s Cafe that serves sweet potato pancakes. I always get them when I go there. Yours look fabulous! Wow, this looks like a perfect breakfast! Or dinner! WOW these look beyond amazing! These look so good. I like pumpkin pancakes but never thought about sweet potato pancakes. You know what sounds good with these? Is infusing a butter with nutmeg, cloves, cinnamon, and maple syrup. All of these pancakes that you post are going to get me in so much trouble. They all look so delicious! What smooth looking pancakes! a delicious combo! SO smooth and sweet…great presentation !! You are amazing. I love to look here to see what new things you have come up with. Keep it up, it is fantastic! I’ve been making a lot of pancakes for my daughters and think this would be a fantastic way to get some veggies into their breakfast! thanks for the idea! i love making pancakes for everyone. whom ever comes over knows he is going to have pancakes. this looks so good. and with sweet potato! YUM! I never had sweet potato pie before!! But I know that it would be great to eat all of those sweet pancakes, so I want to makr this!!! MMMMMMMMMMMM…..Kevin!! Sweet potato pancakes?! Things are getting creative here! Wow – should things this good really be allowed? You are the pancake king my friend. Sweet potato casserole fro breakfast? I am all about that. These look amazing! DROOL, you captured everything pancakes should be in that photo!! I love sweet potato pancakes! Yum, great pic. These look awesome, and I’m jealous of whoever got that bite! Love this idea – wow! I have been completely craving sweet potato pancakes. That pic is torture! I’ll be making these ASAP. Thanks for sharing this recipe! This would be great also as a more savory pancake. We fry our cornmeal in the south and serve it with dinner. 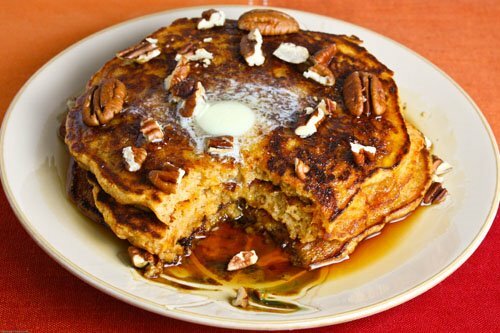 I can see this recipe with onions to make it more savory minus the pecans and syrup. What a fabulous recipe! Thanks for sharing! I NEED a big stack of these right NOW!!! Fantastic! I especially love having breakfast for dinner, and so this would be perfect with some TJ’s chicken sausages or some eggs. I love sweet potatoes. You are awesome. I eat sweet potatoes almost everyday, and this would be a wonderful way to mix things up. Thanks Kevin! Sounds great and definitely going to have to give this a shot. I love pancake…and sweet potatoes…so this recipe will be just worth trying. I’ve made yeast and quick bread with sweet potatoes, and they do make delectable flour based goods! My family loves this….they were a huge hit when I made them. Love this photo Kevin. I love having things sweet like that for breakfast! I am on a big sweet potato kick and these will go great with all the other yummy creations using sweet P’s!! Your pancake recipes are always amazing. Yet another winning recipe. I just love your blog Kevin. What a clever idea. They look lovely! I especially like the pool of melting butter in the middle! After this post, I am urging you to get a cookbook published 😉 Not only are your recipes amazing, your pictures really show off your dishes! penniesonaplatter: I am using a Canon XSi (450D) camera along with Lightroom for organizing and editing. Before I picked up lightroom I was using a really old copy of Photoshop Elements. As for photo editing, I mostly just crop and resize the photos and play around with the auto corrections and white balance. In learning food photography I found that the one thing that helped me the most was getting the lighting right. Since I do not have good access to sunlight in my apartment I had to pick up a lamp. I ended up with a (relatively speaking) cheap Lowel Ego desktop ‘product’ lamp that I have been really happy with. I hope this has helped. Wow – they look fantastic!! I usually go for eggs over sweet stuff for breakfast, but I would definitely gobble these up anytime! What a great excuse to have dessert with a cup of coffee…for breakfast, my fave. Well these are just gorgeous, thank you for posting! This looks great, I love the pool of butter on top! Of course we love this. The last time we made them was in Nov. YUm. First your hot sweet onion dip, now this! BTW that onion dip is the best ever. I just subscribed because I can’t bear the thought of missing out on a great recipe 🙂 Thanks! I love sweet potatoes and mixed in with pancakes is nice twist. I can only imagine the fabulous flavor of these. They’re reminding me just how long it’s been since my husband made me Sunday morning pancakes. *sigh* Great recipe! I always trying new ones and i cant wait to give this one a try,..!!!! I’ve been reading backwards through your blog and absolutely am excited about all the sweet potato recipes! My 3 year old loves sweet potatoes and he hasn’t quite developed a diverse palate but these recipes will be fabulous to start him to expland his horizons! And keep me happy since I love these recipes and will only have to cook one thing! oh gosh, i've posted these on my facebook page and on my sweet potato blog and everytime i look at them i sigh cause i just wish i could have them right now! check out my sweet potato blog, your pancakes were on there! I'm wondering if you're on Twitter?